LSU Law students Zach Miller and Max Roberts were crowned champions of the Manfred Lachs Space Law Moot Court Competition’s North American regional rounds in Washington, D.C., on March 24. Participating for the first time in the competition, the team also took home the award for Best New Team. 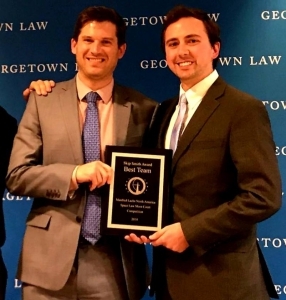 LSU Law students Zach Miller, right, and Max Roberts were crowned champions of the Manfred Lachs Space Law Moot Court Competition’s North American regional rounds in Washington, D.C. The LSU Law team advances to the World Championships of the Space Law Court Competition, which will be held in October 2018 in Bremen, Germany. LSU Law will face the winners of the European, Asian-Pacific and African rounds of the competition. The Law Center’s Manfred Lachs Space Law Moot Court Competition team is coached by Professor and Moot Court/Trial Advocacy Director Jeff Brooks with assistance from Advocacy Fellow Annie Scardulla. The Space Law title mark the third national championship for LSU Law’s moot court and trial advocacy teams this academic year. LSU Law won the 2018 John R. Brown National Admiralty Law Moot Court Competition in Seattle on March 24 and the Peter James Johnson National Civil Rights Trial Competition on Oct. 22 at St. John’s University School of Law in New York City. The LSU Law Center’s Advocacy Programs are one of the largest law student advocacy skills training programs in the United States. More than 150 students participate annually in six internal competitions, more than 25 traveling competition, a series of skills workshops and boot camps, and related simulation courses to develop their skills as persuasive advocates.